We know things are bad in Goa when it comes to dope, but this bad? We picked this bit up from Herald's web edition. From the looks of this header, either Goa's chief minister Digu's expecting a consignment of 'crack' in two days (you know what it means don't you? 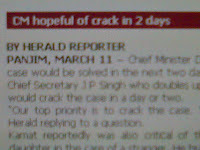 its a crude sort of cocaine) or its the usual mistake made by the Herald's deskies. They need a crack on their heads don't they. Too many mistakes fellas, too many mistakes. The other factor which is much more crucial is the constant meddling by the general manager Manjunath and the Managing Director Raul's PA Michael in the functioning of the editorial. These guys are running amok. There were reports that Herald had sacked personnel manager Gaonkar the day after Erol Jorge joined the TOI. Gaonkar is a gem of a guy and recent reports suggests that the owners are having a rethink. Other guys who have bit of thinking to do is the Gomantak Times. GT's relationship the Sakal group may have been consumated a long time back, but April should be the time when they give up the informal live-in arrangement and prepare for the marriage. GT will be Sakal Times (ST) soon. But some guys aren't too happy with the impending ST status. Not this particular Bhatkar Vithaldas Hegde, who cribbed bit about this at a weekly meeting. The rumbles on The Navhind Times too with a steady stream of guys quitting the newspaper like fleas rushing out from a dying dog. Editor Arun Sinha may need to try and use the services of Dr Silvano Sapeco to figure out an answer this problem.